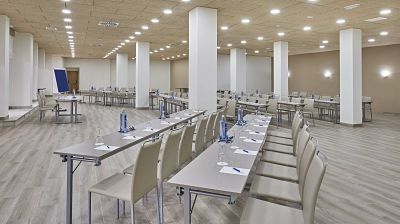 The Hesperia Ciudad de Mallorca hotel is located in La Bonanova, a lovely residential district in the city of Palma which is well connected with the city center and the airport. Features 60 guestrooms that are luminous and spacious. You’ll enjoy comfortable beds and large desktops, plus LCD televisions and free wifi. Most of our guestrooms have balconies, and some feature views of the gardens and outdoor pool. Just minutes away from the beaches of Cala Major and Illetas. A five minute walk will take you to a commercial center full of shops and restaurants, plus the Palma Boardwalk with its culinary offerings and nightlife. The Hesperia Córdoba hotel is located just steps from the famous Mosque-Cathedral of Córdoba, a World Heritage Site. Featuring amazing views of the nature preserve that runs along the Guadalquivir River. The rest of Córdoba’s historic district is only a 10-minute walk away, across an ancient Roman bridge. Our rooms, welcoming and modern, include comfortable beds, free wifi, and lots of peace and quiet. Many guestrooms face the historic district, some toward the Mosque-Cathedral, others toward the river. With its picturesque colorful windows, the Hesperia Bilbao hotel has a striking silhouette that stands out among Bilbao’s other riverside buildings. Its privileged location is just opposite the Guggenheim Museum, and a five minute walk from the commercial and financial districts. The airport is just a 15 minute drive away. Our 151 guestrooms are both modern and welcoming. There are plasma screen TVs and free wifi in each and every one. The Presidential Suite boasts its own terrace, private jacuzzi and incredible views of the city of Bilbao. The Hesperia Zubialde hotel is located just opposite the new San Mamés football stadium, close to the Nervión River. The Guggenheim Museum can be easily reached on foot, while the metro station that will take you to the old quarter is just steps away. Inside the hotel, which dates to the 1920s, there are 82 guestrooms. Having been renovated within the last three years, all of the rooms are luminous and large, with hard wood floors. The hotel also has various multi-functional rooms for meetings and events. And when it comes to leisure time, we’ve got you covered. Our restaurant specializes in Basque cuisine, while our new café-bar features a terrace with views of the new stadium.